Because most fruits have large amounts of water and fiber, they are generally low in calories and eating them can be beneficial when trying to lose weight. Fruits contain naturally occurring sugars, which makes them a great food to snack on if you need a boost in energy or are craving something sweet. In this article, I will list out some fruits that are low in calories. Also, if you are not sure about the number of calories you should be eating per day, use the tool below to calculate an estimate. Despite its extremely sweet taste, watermelon is very low in calories. The primary reason for this is given away by its name; watermelon is made up of more than 90% water, which has 0 calories. A cup of watermelon has 0 g of fat, 12 g of carbohydrate (1 g dietary fiber, 10 g sugars) and 1 g of protein. It also provides you with vitamins A & C and small amounts of other vitamins and minerals. Watermelon has large amounts of lycopene, a phytonutrient that gives lots of fruits and vegetables their red colour. Lycopene is a very powerful antioxidant that can protect against a number of diseases, including certain types of cancer. The consumption of watermelon can help to lower blood pressure, improve heart health, soothe muscle soreness, fight inflammation and re-hydrate the body. When you take a look at grapefruit, you would think that it is sweet tasting. Unfortunately this is not the case; even though it has 16 g of sugar per cup, it has a bitter taste, making it lose popularity among a lot of people. Grapefruit has long been associated with weight loss and studies seem to suggest that this might be the case. This study stated grapefruit consumption was associated with significant weight loss, even though the exact mechanisms by which it worked were unknown. Other studies have found that the consumption of grapefruit may lower cholesterol & triglyceride levels and protect against certain types of cancer. If you aren’t a fan of grapefruit, don’t douse it with sugar to make it taste better. Instead, eat it together with a sweeter tasting fruit. Strawberries are one of my favourite fruits to eat, especially during the summer when they are their most succulent. They can be enjoyed on their own or frozen and used to prepare delicious sorbets and smoothies. Strawberries contain large amounts of vitamin C. In fact when compared weight for weight, strawberries have more vitamin C than oranges do! A cup of strawberries provides you with roughly one and a half times your daily requirement. Vitamin C is perhaps the most well known vitamin. It keeps your gums healthy, assists with iron absorption & wound healing and is required for cardiovascular function. 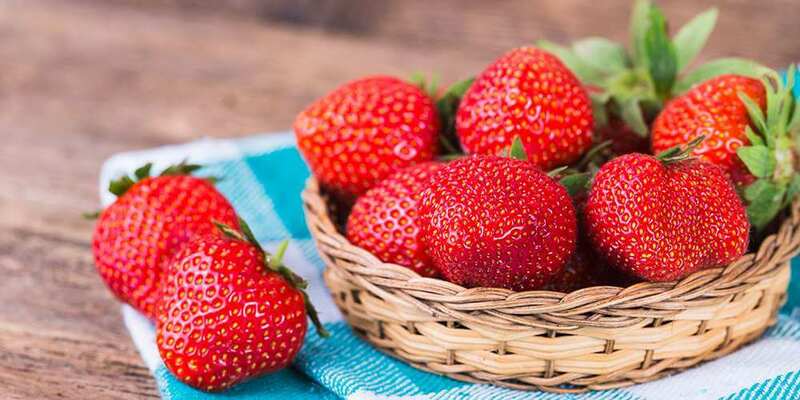 If you are trying to lose weight, strawberries are an excellent fruit to add to your diet. They are are low in calories, sweet tasting and can be incorporated into lots of recipes. Cantaloupes are melons with orange coloured flesh that is soft and juicy. Like watermelon, cantaloupes are very sweet (they have 13 g of sugar per cup) but low in calories, thanks to their high water content. Orange coloured foods like carrots & sweet potatoes tend to be high in vitamin A, and cantaloupe is no different. A cup of cubed cantaloupe has 108% of your daily value (DV). Vitamin A is a fat soluble vitamin and a powerful antioxidant. It supports eye, skin & hair health, fights inflammation and provides immune support. Like cantaloupes, honeydew melons are also low in calories – a cup (170 g) has 61 calories. Both cantaloupes and honeydew melons can be chilled in the fridge and then combined with other fruits to prepare a fruit salad that can be enjoyed at the end of a meal. The peach is native to China and has a unique mouthwatering aroma & flavour. Peaches contain small amounts of a variety of nutrients including vitamins A, C, E & K, potassium, manganese and copper. The polyphenols found in peaches have been studied for their potential effects against breast cancer cells. They may also be able to protect against candida (a common type of yeast infection), thanks to the bioactive compounds they contain. The most common types of peach are freestone and clingstone. You can use peaches in lots of different ways – include them in parfaits, use them to make popsicles or even grill them in the oven. Check out this page for some interesting recipe ideas. When I was a child, we had a papaya tree in our garden and I used to eat this tropical fruit very often. I am glad I did because papayas are an incredibly nutritious fruit. Papaya consumption can help to improve digestion, thanks to an enzyme it contains that can make it easier to digest protein. This study found that a papaya based formula lead to an improvement in constipation and bloating. Like with many other fruits, papayas nutritional strengths are its high vitamin A & C content. Because of this, it protects the skin against damage, fights inflammation and has anti cancer properties. Blackberries contain a large amount of dietary fiber, providing you with 7.6 g per cup. This equates to roughly a third of your daily requirement. Fiber maintains digestive health, helps to lower cholesterol levels and keeps you feeling satisfied for longer. These berries are also one of the best fruit sources of vitamin K, a vitamin that is primarily abundant in leafy greens such as kale and Swiss chard. Vitamin K is required for blood clotting and bone health. Blackberries contain lots of other beneficial compounds, which is why they are used as an herbal medicine to treat a multitude of medical conditions. One of these compounds are tannins, which bring with them many health benefits. Blackberries might be growing in your garden at this very moment. If they are, pick a handful, give them a wash and enjoy! Plums belong to the same family as peaches and come in a wide variety of sizes and colours. They can be sweet or tart, depending on when they are picked. Like many of the other fruits in this article, they are rich in antioxidants, making them an excellent food to eat. Plums assist with digestion, support cognitive health and boost the immune system. Plums should not be mistaken for prunes, which are dried plums. Weight for weight, prunes contain roughly 5 times the calories that ordinary plums do and should be eaten in moderation. Another fruit that looks similar to the peach is the apricot. It is smaller in size and also very low in calories; an average sized (35 g) apricot has only 17 calories. Oranges are sweet tasting & acidic citrus fruits that are very well known worldwide. They are associated with being a great source of vitamin C. Indeed, if you visit your local chemist and ask for some vitamin C, there will likely be a picture of an orange on the packaging. It is important to keep in mind that when trying to lose weight, eating ordinary oranges is a better option than drinking orange juice. This is because when you eat the solid fruit, the chewing involved and the bulk that the food adds to your stomach tells your brain that you have eaten and should feel less hungry later on. Unfortunately this process is not as efficient when you drink orange juice, and you are likely to consume more calories than you should later on. Pineapples are the only known food source of Bromelain, an enzyme that can benefit one’s health. Studies have found that it may be effective against cancer, treat digestive disorders, reduce allergies and improve joint pain. Pineapple is also high in manganese, a mineral that supports bone health, is needed for enzyme function and reduces PMS symptoms. Whenever possible, aim to eat fresh pineapple over canned versions. Whilst the latter is also low in calories, the former will be more nutritious and often tastes better. You can enjoy pineapple on its own, use it to prepare salsa or add it to stir fries. Cherries are a delicious fruit that unfortunately are not available in some parts of the world. They are low in calories and their consumption may play a role in helping to prevent obesity. An interesting study found that cherry consumption reduces the risk of gout attacks. 633 individuals with gout took part in the study; cherry intake over a 2 day period was associated with a 35% lower risk of gout attacks. Other studies have found that cherries may increase post-exercise recovery and lower blood pressure. To reap the benefits that cherries have to offer, don’t confuse fresh cherries for the sugar sweetened ones that are found on top of cupcakes. The cherries that you ideally want to eat are those that have been freshly picked off a tree. When people think about healthy foods, apples are likely to be one of the first things that pop into their mind and it’s cliché to say it, but an apple a day does keep the doctor away. Apple consumption may help to lower your risk of diabetes, prevent cancer, fight asthma and promote good gut bacteria. They come in lots of varieties (and colours), some of which include Golden Delicious, Gala, Fuji, Granny Smith, Honeycrisp and Cripps Pink. Apples can be sweet, tart or a combination of the two. Sliced apples with almond or peanut butter makes a protein rich snack that is filling and nutrient rich. If you are looking for a sweet tasting fruit that is low in sugar and calories, raspberries are a great option. A cup only has 5 g of sugar, which is far less than many other fruits. Because of this, you can make your own healthy low sugar jam at home, using raspberries as the main ingredient. Eating raspberries may boost brain function, improve heart health, help with diabetes management and assist with weight management. Like blackberries, raspberries contain a lot of dietary fiber, providing you with 8 g per cup. Eat raspberries on their own, add them to oatmeal or include them in smoothies like this one. Blueberries have often been considered to be one of the healthiest foods on the plant, and for good reason. Compared to other common fruits and vegetables, they are thought to have the highest antioxidant capacity. Studies such as this and this have found that blueberries can reduce LDL cholesterol oxidation and free radical damage to DNA. Other studies show that blueberries maintain brain function & improve memory, are beneficial for heart health and have anti-diabetic effects. Eating a variety of berries is highly recommended because they are low in sugar and calories but are extremely nutrient dense. We have spoken a lot about vitamin C in this article. Well if there is one go to fruit for this vitamin, it would be the guava. Weight for weight, it contains 4 times the amount of vitamin C that oranges have, making it one of the best sources that there is. Guavas are a tropical fruit that many people may not know of. They have a green outer skin and a lovely pink coloured inner flesh. The next time you go grocery shopping, ask if they have guava. You may be pleasantly surprised to learn that this delicious fruit was available where you live all along. The vast majority of fruits are very low in calories, thanks to their high water & fiber content. The table below provides calorie information for 100 g of foods classified as fruits. You should aim to eat around 2 servings of fleshy fruit per day (a cup of fleshy fruit is 1 serving). If you lead an active lifestyle, you can eat more fruit. Is a protein shake a good breakfast?